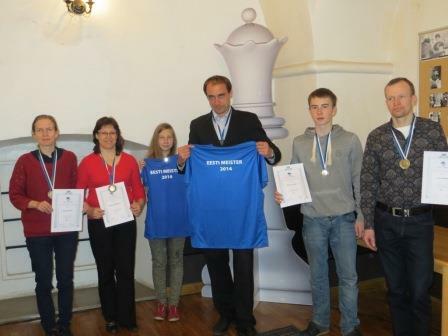 The 2014 Estonian Chess Championships for men and women took part from 28th April to 4th May in Tallinn, the capital and largest city of Estonia. GM Kaido Kulaots wins the Estonian National championship with 7.5/9 points, leaving the runner-up half a point behind. FM Ottomar Ladva takes the silver with 7/9 points, while third place is shared in a 3-way tie by IM Tarvo Seeman, Roman Jezov and FM Ilja Vovk with 5.5/9 points each. In the women section 15-year-old WCM Mai Narva surprises with a gold medal. She is first with 5/6 points, half a point ahead of the experienced WIM Monika Tsiganova, who finishes second with 4.5/6 points. WFM Regina Narva and WCM Triin Narva share third place with 3/6 points each, but Regina Narva takes the bronze, thanks to her superb tie-break score.